I took the above photograph on Rollei Retro 400S film, loaded in a Pentax Spotmatic camera. 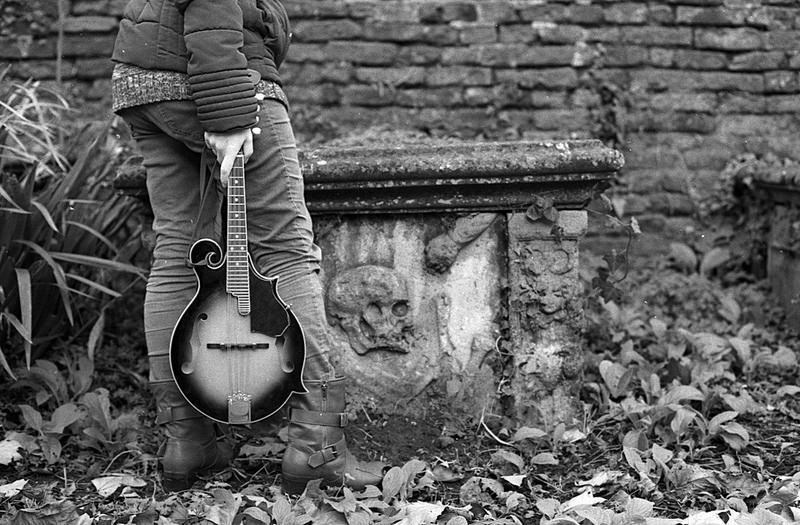 Anita holding my Chinese made Countryman F-style mandolin in the village church yard. Developed in rodinal. Why do I like mandolins? I don't really know, but I absolutely love mandolins. The mandolin descends from a long line of small oud or lute-type instruments that had been circulating Africa and Europe for many centuries or perhaps even more. However, They really took form as the mandolino in the Naples area. Between the late seventeenth and early nineteenth centuries the Neapolitan mandolino (meaning almond-shaped) evolved to have as a default, a bowl shaped back made of glued strips of wood, a bent sound table, decorated beading around the sound board, a tortoise shell pick guard, a narrow neck, , four pairs of metal strings, tuned in pairs the same as a violin - GDAE, and good quality tuners. It had evolved from being a small oud, into the classic Neapolitan bowl-backed mandolin. The Neapolitan bowl backed, is still the mandolin of choice for many mandolinists performing for tourists in Italy, for fans of traditional Italian folk music, and for some classical mandolinists. However, as the mandolin craze spread across Europe during the nineteenth century, so it took local turns and twists. The bowl was sometimes replaced with a flat or curved back for example. In Greece, they already had their own versions - the bouzoukis. In Portugal, it took the form of the bandolim - which also made it across the Atlantic to Brazil. Meanwhile, both Brazilian bandolinists, and Italian mandolinists were wowing the thriving palour music scene in the USA. It was in the USA, that new forms of mandolin were produced and popularised, particularly by the Gibson guitar company, with their A and F style American mandolins. Mandolins started to fall into the hands of Blues musicians. Jazz musicians picked them up. When Bluegrass launched, Bill Munroe picked a Gibson F5-style. Today, it seems as though the USA has replaced Italy, as the stronghold of the mandolin. Here in the UK, when many people first see a modern mandolin, they often mistake it for a ukulele or even a banjo. They don't really know what it is, or what it sounds like. The mandolin rarely makes it into popular music - although it has starred in songs by Led Zeppelin (the Battle of Evermore), R.E.M (Losing my Religion), and Rod Stewart (Maggie May). So why do I love mandolins? I have no musical background. I had never really tried to play a musical instrument outside of a stylophone during the 1970s. I sucked in music class. I could not read noted music at all. That was my musical experience up to the age of fifty two. Then I walked into the local music shop. He had the Countryman F5 style on the wall, at the end of a long row of guitars. It was just so pretty, I didn't think about it. I just handed over the plastic. Nothing to do with liking any style of music, any musician, or the sound of the mandolin. It was just the looks of it. Ironically the owner of that shop was born in Italy - so that I can still say that I bought my first mandolin from an Italian. The Countryman label is used sometimes by a Chinese distributor to the UK. I have tracked the same mandolin under different labels in Europe and in the USA. Like so many Chinese stringed instruments - perhaps not the best wood - it is quiet, and not the richest tone, but for the price it was incredible value, with all of the goodies that you'd expect on a much more expensive American-made bluegrass mandolin. A simple change of the strings improved the tone noticeably. It plays well. A good mandolin to learn on. I took classes with a very good mandolin teacher for a while. Good, in the sense that he was a mature music teacher of the old school, and a genuine mandolinist himself, but not so good in that he was so strict, that I eventually felt too nervous to play, and after around six months, regrettably canceled my classes. Since then I have tried to self-train, but instead have perhaps more simply taken the route of playing for fun. I would like more spare time, and more self discipline in order to study more efficiently. I have plenty of great books, and a host of great teaching videos on Youtube and elsewhere. I'm attracted to traditional Italian, and to Irish or Scottish folk, but I'd like to have a crack at some blues. So much music to learn, so many techniques. Ever since my initial attraction to that instrument in the music shop, I have found other reasons to love mandolins. Okay, they don't have the warm big sound of an acoustic guitar. But they are so small, so portable. I absolutely love practicing on my mandolin. I can't really explain why. It's not a guitar. It is more personal. I have to admit that I have wasted money buying a couple of cheap mandolins on Ebay. An old Neapolitan bowl back, and a Romanian curve back, distributed by a Scottish company as the Celtic Petit. Although both are louder, neither play as easily as my Chinese Countryman. As I said in my last post, I have commissioned a hand-crafted mandolin from a local luthier, Gary Nava. I'm so looking forward to it later this year.